A local motorcycle group is giving back to families in need this Thanksgiving. 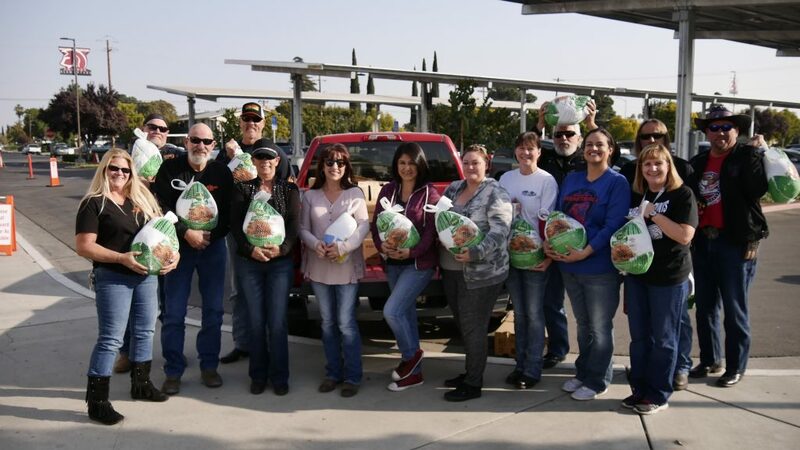 The Fresno chapter of the American Bikers Aimed Toward Education (ABATE) personally delivered 40 turkeys to Tarpey Elementary School on Wednesday, Nov. 14 to be distributed to families in the community. Members of Tarpey’s Parent Teacher Club were on hand to receive and help unload the turkeys from the back of a pickup truck. Georgi Leonardo, the school’s librarian and board member for ABATE, bridged the collaboration between the PTC and the charitable motorcycle group. “Our parent club puts together food boxes for 40 families from our community every year, which is great because a lot of people contribute even if they don’t have a lot to give,” she said. The campaign relies on a schoolwide canned food drive to fill the boxes. Then, the PTC – unless otherwise donated – purchases the rest of the items like turkeys, pumpkin pie, bags of potatoes and biscuits. The food boxes were distributed over the course of the next two days to preselected families.